I bought this chair many years ago. I have always been a sucker for old chairs. This one needed someone to take it home and that would be me. Although I bought this before moving to Florida 7 years ago, I still remember when I bought it. Strange, I know. I glued the seat together and clamped it. To make it even more secure, my husband added some round washers over the crack, on the under side so that it would not come undone. Once it was glued and dried, I sanded the chair. Now to paint it. I used an antique white chalk paint. I liked it but thought it needed a little something so I painted a couple of stripes on the seat - two narrow ones and one fatter one. This chair has to be the most comfortable chair to sit in. It just seems to conform to your bottom. I distressed it a little and I applied wax to the chair. I just loved it. Not sure why I waited so long to update this chair, but so glad I finally did. It just seems to go in so many places in my home. You can't even see where it was cracked and it is so functional. The post Giving New Life to a Cracked Chair first appeared on Eclectic Red Barn. Thank you so much for featuring my updated cracked chair. I love blue stripes too. Looking for to seeing your post this weekend. Love anything with stripes. Wonderful makeover... I have a chair that I'm going to do this to! Thanks for the inspiration! Do you have a Pinterest button for this? What a sweet comment on my chair. I appreciate it. I do have a Pinterest button. Just hover over the pic and the button is there. Oh! I found the pin button! Hi Beverly, this finish is just perfect for a farmhouse chair makeover. 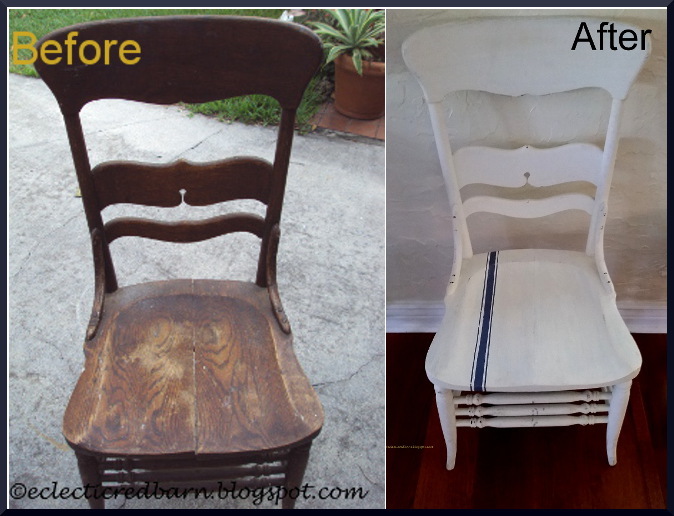 I have a thing for old chairs as well, one day my dinette set will be complete with a full set of mismatched beauties! 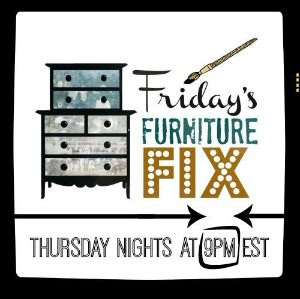 Thanks for sharing at #FridaysFurnitureFix, your project is this weeks feature! I am a sucker for old chairs. I think a set of mismatched chairs would be amazing. I need to look for more chairs. I can't wait to see your set one day.